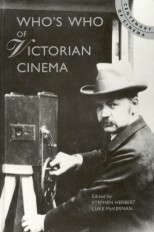 The striking appearance adopted by performers to distinguish themselves in the competitive world of music hall provided film-makers with an immediate centre of attention for their brief productions. There was no mistaking G.H. Chirgwin when he appeared in two of Robert Paul's earliest films. 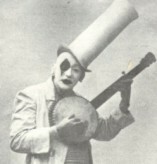 Billed as 'The White Eyed Kaffir' Chirgwin had appeared as a black face minstrel from childhood, evolving an act that mixed sentimental songs, wisecracking comedy and a bizarre costume and make-up consisting of tight black body-suit, extravagantly tall hat and a white diamond painted over his right eye. A Filoscope flicker-book preserves the opening of Chirgwin in his Humorous Business (1896), while a frame illustration shows that Chirgwin Plays a Scotch Reel (1896) used clay pipes in the same way that Chaplin employed bread rolls for the famous dance in The Gold Rush. Chirgwin also featured in a synchronised sound version of his tear-jerking song The Blind Boy for Walter Gibbons' Phono-Bio-Tableaux in 1900, and a 1917 feature film based loosely on the song.